I had planned to post something different today but as usual I procrastinated until the last day and then, even though I left early, I got home late because the traffic was so bad. Since I didn't have time to take the photos I wanted I'm resharing some of my "diet" food from the past. As many of you know I lost quite a bit of weight a few years ago and I've pretty much kept it off but now a few pounds...okay a little more that "a few"...more like 20 lbs have returned! Ugh! I'm grateful that it all hasn't come back but I'm not even liking the 20 extra pounds so I'm back to eating better and working out more again. 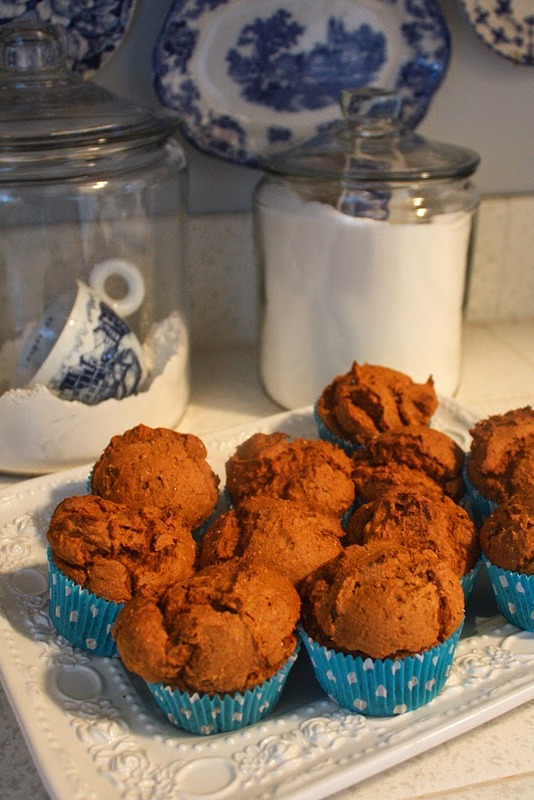 For these muffins I just use a box of spice cake mix and stir in one small can of canned pumpkin (do not add any other ingredients, just the box of cake mix and the pumpkin) and bake them until they are done! Really simple and fairly healthy! I usually try to stay away from processed carbs but I do allow myself a treat once in awhile! those muffins look scrumptious! Thanks for hosting us Cindy! Thanks for hosting Cindy. I make those same muffins, but I add a few chocolate chips...you might want to try that. I am trying to lose 20 lbs. too. Cindy, I need to lose weight, too. We're about the same age I think, and I've been so inspired by you and your weight loss. It's really hard to do and you've made it look so easy! I only managed to lose 10 pounds and have gained it all back in the past two months. So hard to lose and so easy to gain back. I need to lose more than 20 but I'd be happy with that for a start! Thanks for the tips and recipes!!! The berries look delicious! Thanks for hosting Cindy! OMG I thought that I was the only one that made pumpkin muffins that way!!! My kids love them!! Thanks for hosting another great party!! Hi Cindy! Oh, your diet food looks very yummy and I know you'll loose your weight because you're so disciplined. Wish I could be. :) Thanks again for hosting your party as we're making a big change in our life right now and I wanted to share it with you. I fight my weight all the time and seem to have finally found that tracking my calories, and calories burned, on line really helps. I'm using the LiveStrong site but there are probably others. I'm with you! Why can those pounds sneak on but not sneak off?!?! Hi Cindy, I'm currently on a weight release program too. What helps me is to try not to eat after 8. I love sweets! I do my best to eat any sweets in the afternoon, so my body will burn it off. I have more weight to release than you. I do my best to celebrate all the milestones I've hit so far. Wishing you a Happy Memorial Day weekend and smooth weight release journey. Your weight-loss successes that you have chronicled on your blogs have inspired me so much. I wish it weren't possible for the pounds to creep back when we are busy with Life. You've shaped up before and you will do it again. I've missed seeing photos of your beautiful self! Last year, I discovered Tone It Up with Katrina Hodgson and Karena Dawn. Although they and most of their followers are much younger than I am, I have had a blast trying to follow their workouts and program. From April to October last year I lost 13 pounds. I gained a lot back over the holidays by eating rich food and sweets and not exercising much. I've been more dedicated to consistency lately and am seeing weight come off again and feeling more energized. You might want to check them out as a variation on what you usually do for fitness. Right now they are in the midst of their "Bikini Series" which prepares for summer. I don't care about bikinis, but I want to feel better. Makes me feel young again! I love how elegant you make the simplest meals look. 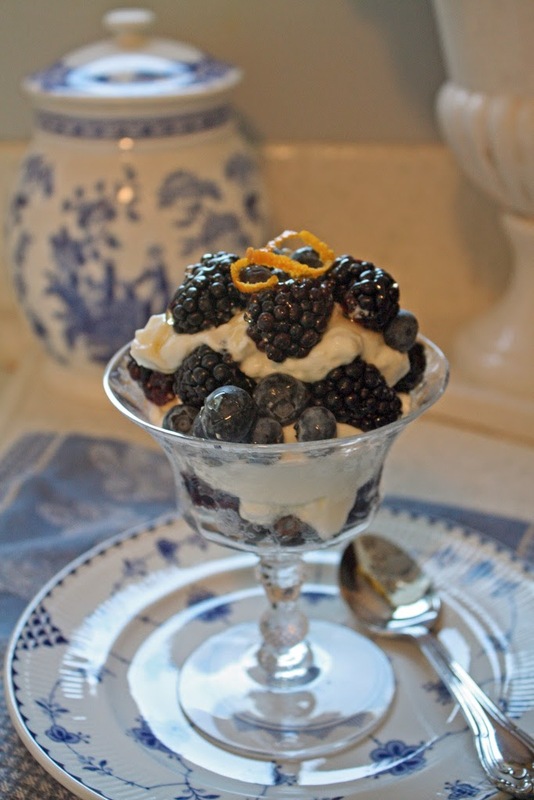 Love the berry/yogurt photo. Best to you. I'm so glad you check in once a week. I know you are super busy,but I so enjoy your blog. I hear ya! I haven't been on a diet for 7 years; I actually spent a long time trying to gain weight, but since I started weight lifting I have to get some of the weight off because I'm just too bulky! Just looking at the dessert cup makes me hungry! I have been doing the low carb thing and I am 3 weeks in! I never lasted more than a couple of days doing low carb! I swear today I just want a whole pot of rice...I could just swallow it I want carbs so badly! LOL Thanks for a great party! Good luck on your diet! ...funny, I just ate 3 marshmallow cookies before I logged on here!!! No.38 Miss Maggie's Side Table Redo!! ADORABLE!!! 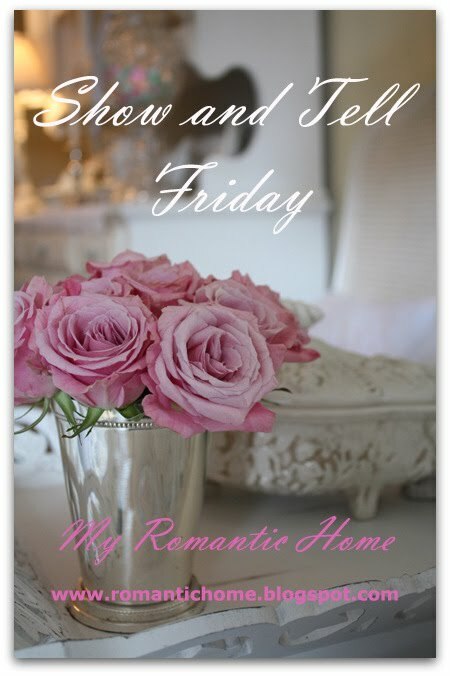 thanks for your beautiful blog.....lots to be inspired by.